These cute bear cupcakes would be great for a baby shower, fairy tale themed birthday party or any Goldilocks who loves cupcakes. What You Need: 1 cupcake; chocolate frosting; white or vanilla frosting; pink icing (in a tube or in a pastry bag with #1 metal tip and coupler); candy eyes or small candies; pastry bag and #5 metal tip. How to Make It: Frost cupcake white. Using pastry bag and #5 metal tip, pipe bears: make two faces larger than the third baby bear face and add smaller circles for ears. Add eyes. Use #1 tip and pink icing (or icing in a tube) for nose and mouth. 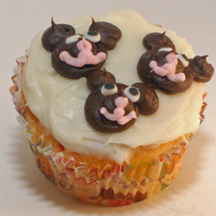 This entry was posted on Tuesday, February 17th, 2009 at 8:06 pm	and is filed under animal cupcakes, baby shower cupcakes, birthday cupcakes, cupcakes from stories and books, fantasy and magic cupcakes. You can follow any responses to this entry through the RSS 2.0 feed. Responses are currently closed, but you can trackback from your own site.